Attempts to fix America’s health care crisis that aren’t universal, simple, and don’t eliminate private insurance are doomed to fail. We need a Medicare for All plan that covers everyone, period. Since Bernie Sanders made it a cornerstone of his 2016 presidential run, Medicare for All has become an increasingly popular and obvious demand. The system, which works by eliminating the private insurance market and relying on the government as the sole payer of health care costs, has been used by many other countries for decades. Americans, by contrast, pay costly monthly premiums to private insurance companies and still can’t even use their benefits because of outrageously high deductibles. And if you’re fortunate enough to receive decent health insurance through your employer, you are left vulnerable to an otherwise hostile workplace, since keeping your health care depends on keeping your boss happy. The failure of Obamacare to rein in costs and reliably expand coverage has led people to a logical conclusion: why not just get rid of private insurance altogether? Unfortunately, under the present administration, a federal improved Medicare for All program is unattainable — just recently, President Trump felt compelled to attack Medicare for All in a USA Today op-ed. As a result, many have retreated to state legislation. But state single-payer efforts face a number of major challenges. One would be navigating the existing, fragmented federal health care system. To streamline this process, Rep. Pramila Jayapal, D-WA, has put forward a bill that would make it easier for any state to request permission to opt out of programs like Medicare and Medicaid and receive federal waivers in their place — a prerequisite for any state single-payer health care program — via a single application to the US Secretary of Health and Human Services. While Jayapal’s plan would put some blue-state voters half a step closer to their own state health programs, it does very little to require that those programs do anything more than further balkanize our existing system. The most glaring issue with her plan is that it has few minimum requirements for what a state single-payer plan would need to provide in order to allow federal funds to be redirected to state health plans. After the fanfare around and then failure of Obamacare, one would hope that Democrats had seen the problem with tinkering around the edges of American health care, trying to preempt objections to a single-payer system by being “reasonable.” Jayapal should be commended for trying to bring us closer to winning Medicare for All, but she’s put forward a bill that repeats many of the same mistakes. Especially when compared to the Medicare for All legislation she is already a co-sponsor of, it’s hard to explain why this overly complicated and much less politically inspiring bill even exists. To get into the problems with Jayapal’s bill, we have to get a bit wonky. 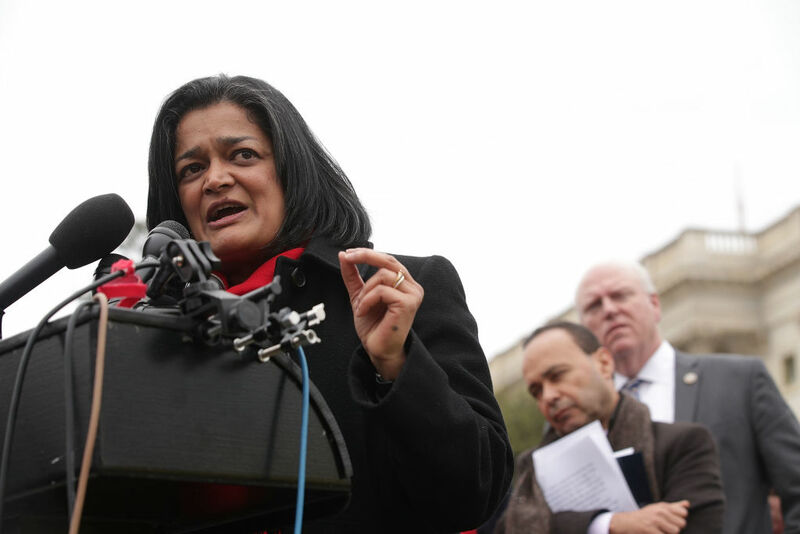 Unlike the existing House and Senate Medicare for All bills, which would both eliminate the private insurance industry and establish a true improved Medicare for All program, Jayapal’s bill does not require that states seeking waivers prohibit private health insurance or the private administration of public health plans. In fact, she explicitly allows for states to continue contracting out the administration of their health plans to private corporations. A major benefit that comes with implementing public health insurance is that it cuts out the parasitic health insurance industry which pockets 30 cents of every dollar Americans spend on health care; Jayapal’s bill would allow those corporations to continue extorting the public, now from behind the cover of a purportedly public health program. In effect, Jayapal’s bill only gets at the symptom — lack of universal coverage — while the Medicare for All bills in the House and Senate tackle the cause: private insurance. If the bill hopes to address the root of the problem, it would include a requirement that any state seeking exemptions would prohibit competing commercial health insurance and contracting out state responsibilities to private corporations. Under our current system of private insurance, an American making around $50,000 spends a little over 9 percent of their income on health care, about $4,500 per year. That’s $4,500 paid into a system where you still have to worry about going to the wrong hospital, finding a needed specialist in network, or debating whether your back pain is really bad enough for that office visit co-pay. Any solution to our present crisis needs to address this problem. Unfortunately, the only spending requirement in Jayapal’s bill is that no more than 5 percent of the population spend more than 10 percent of their gross adjusted income on health care. But this means very little when you consider that the spending cap is effectively the same percentage that Americans are already paying today. If the cost to the individual is going to be roughly the same, we might at least expect better benefits under a state plan. Once again though, Jayapal’s bill provides hardly any minimum requirements. The only baseline states must ensure is that people receive health coverage at least as comprehensive as the coverage they would have otherwise received under existing federal programs like Medicare and Medicaid. That means that anyone who doesn’t already qualify for federal benefits — a majority of Americans — would have no guaranteed state benefits. States could of course choose to provide excellent coverage to their residents; they could just as easily provide next to nothing. The bill’s meager requirement, stipulating that no less than 95 percent of those covered by a state plan must be protected under the spending cap, raises a troubling question: what about the other 5 percent? If passed, her plan would allow them to continue being crushed under life shattering medical debt. Even if the spending cap were extended to 99 percent of the country, it would still be qualitatively different — and more importantly, weaker — than a universal program. This is because public programs that aren’t truly universal open themselves up to political attacks. If even a fraction of a percent of the population were left to the whims of the market, that would mean some people would still suffer under the for-profit health care system. But now rather than directing their anger about that suffering at insurance companies, those not covered could credibly point at the public program as the source of their misery. We would be giving capitalists a weakness they would be all too happy to exploit in an attempt to bring down the entire project. The World Health Organization, for instance, sketches out the three dimensions of universal coverage: the percentage of the population “covered,” the degree of cost-sharing (that is, out-of-pocket payments like co-pays or deductibles), and finally, the comprehensiveness of benefits. To these I would add a fourth element, of equity: to what extent does the nation offer a similar level of access to providers, hospitals, and other healthcare goods and services to all, regardless of economic means? While Jayapal’s bill does attempt to fulfill the first requirement by asking states to reach 100 percent coverage within ten years, it has woefully insufficient guidelines for cost-sharing, benefits, and equality of care. Compare all this with Bernie Sanders’s plan, which proposes universal, comprehensive coverage with no financial barriers to care. These shortcomings make it difficult to accept that, whatever her intentions, Jayapal’s bill would be a step forward in the fight for universal health care. Supporters will almost certainly point out that her bill is only meant to streamline the process of establishing state health care programs. The real test will be whether individual states actually implement strong universal programs. But that only leads us to the final worry we should have about her plan. If implemented today, that means state health care policy recommendations could be made by a bloc of three Republicans and whoever is appointed by Nancy “we’re capitalists and that’s just the way it is” Pelosi. I wouldn’t rest easy with those odds. To top it all off, for better or for worse, the Secretary of HHS is not bound by the panel recommendations and may grant waivers as they wish. Similarly, they are responsible for deciding the total funds to be released to any state that qualifies for the program. It isn’t hard to imagine some creative conservative legislators using this process to introduce terrible state health care programs that would nonetheless be legal and granted waivers in an effort to deflate the broader movement. What we have in this bill, then, is no doubt a good-faith effort to fix American health care, but one that can’t succeed. States, unlike the federal government, have to maintain balanced budgets. As a result, they are much quicker to slash state benefits than they are to raise state taxes, so any reduction in federal funding — which could be done unilaterally by the Secretary of HHS — or state tax revenue could be devastating. Shortfalls would lead to state budget crises and the Wall Street Journal headlines about profligate blue states would write themselves. It’s been well documented how difficult it is for states to finance genuine single-payer systems, and it’s not clear how the bill resolves that issue. More than anything, Jayapal’s bill demonstrates how unwieldy and overcomplicated state single-payer bills have to be under our current system. Between plans that don’t actually cover all residents, the difficulty of truly putting an end to private insurance, and the vulnerability to hostile administrations, the bill suffers from many of the same problems that plagued Obamacare, now just split between fifty different states. Obamacare blunted some of the worst excesses of our health care system through a Rube Goldberg–like system that forced more people into the private insurance system while temporarily pushing prices down by subsidizing private insurance with public dollars. But because it did not address the source of the problem — for-profit health insurance — prices are continuing to jump upward, and decent coverage is increasingly hard to find. No one really wants Obamacare anymore — those of us on the Left just know that it’s better than whatever death trap Republicans would put into place. Legislation like Jayapal’s that doubles down on this fragmented health care system will almost certainly lead to further infuriating confusion and distrust for public solutions. As a co-sponsor of HR 676, the current federal single-payer bill that has 123 co-sponsors, and a co-chair of the newly formed Medicare for All Caucus and Medicare for All PAC, it’s odd that Rep. Jayapal is pushing a separate federal bill. Jayapal has been promoting this as a route to universal health care — it has even been covered as a “Medicare for All” bill in the press. But as noted above, by the World Health Organization’s own criteria, this bill should not be thought of as “universal,” let alone worthy of bearing the designation “Medicare for All.” Jayapal also admits it is unlikely to pass until we have a Democratic congress. If we’re waiting for “next year or the year after that,” why not put all of our efforts toward implementing a federal universal single-payer health care program? One possible explanation is that Jayapal sees this is an incremental fight to be won through a succession of unobjectionable technical workarounds. But this is the wrong approach. The Democratic Socialists of America and other leftist organizations recognize that the fight for universal single-payer health care is political, not technical. There is no clever fix that will get all parties to the table. We know that most of the current US congress and the interests they represent will fight tooth and nail to oppose a true right to universal health care in the US. The answer is not to weaken our demands to what might be plausible in the current “political climate. “We have to articulate and mobilize around clear and strong working-class demands in order to change the political climate. It’s this commitment to a simple but uncompromising demand that has brought us to the point where a majority of Americans, including registered members of both major parties, support a single-payer or Medicare for All insurance system. Capitalists have been ruthlessly pursuing their interests for decades by making workers as vulnerable and exploitable as possible. Abolishing the predatory private insurance industry and the threat of devastating health care debt once and for all would be an incredible first step toward taking power back from the millionaires and billionaires that run our country. In order to win this political struggle, we need to build a mass movement across the country with a single unambiguous demand: Medicare for All. One program, everybody in, nobody out, comprehensive coverage, no fees, co-pays, or premiums. The fight for a truly just health care system is going to be the fight of and for our lives. Let’s not settle for anything less. Andrej Markovčič is an organizer with the Democratic Socialists of America. He lives in Seattle, Washington.